Wildlife sitings abound, and wombats easily seen! An inspiring overview of Mountain Seas, nestle between the Mountain and two beaches! 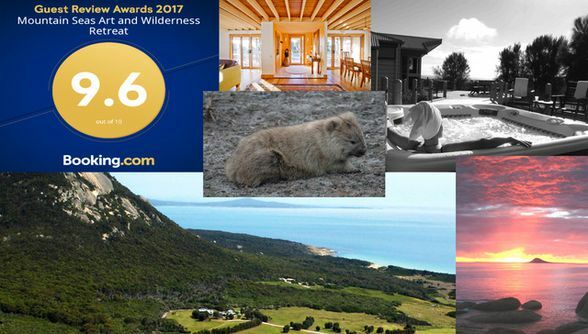 Imagine stunning scenery with easy access to rugged wilderness, a well-equipped Arts Centre, abundant wildlife (and wombats!) 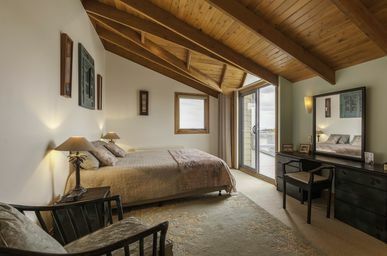 and cozy comfortable rooms, all with mountain or ocean views. 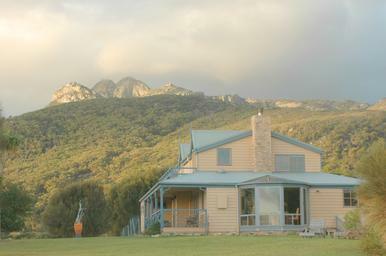 Flinders Island’s extraordinary beauty combined with Mountain Seas’ facilities provide an exceptional venue for conferences, retreats, individual relaxation and workshops of all kinds. From bush walkers, to bird watchers and those looking for a retreat from hectic life, Mountain Seas can meet your idea of a perfect getaway. All this is complemented by an organically certified property. 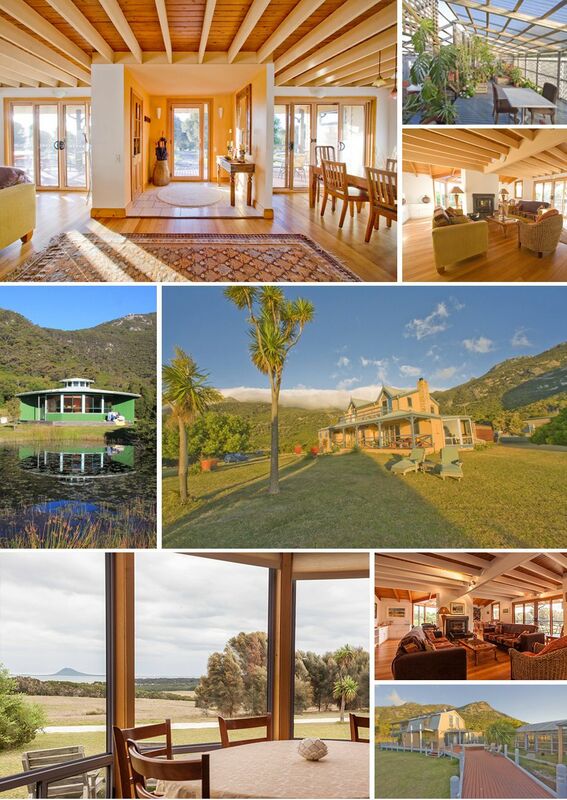 Mountain Seas Retreat offers elegant accommodation, easy wilderness access, and has the added benefit of an Arts Centre to promote creativity in a variety of ways. We welcome individuals, couples and small groups to immerse themselves in the natural world and to find their unique creative expression. That may be photography, writing, drawing or painting…or simply curling up and reading a good book! We can support your exploration of the Island, relaxation or your deep dive into creativity. Mountain Seas Retreat provides the unique potential to work with instructors on the island who can hold arts workshops, including photography, watercolor, ceramics, painting and music. Mountain Seas is also able co-ordinate guided bush walks and island tours. Facilitators with existing groups are encouraged to take advantage of our arts facilities to host their own arts retreats or conferences. 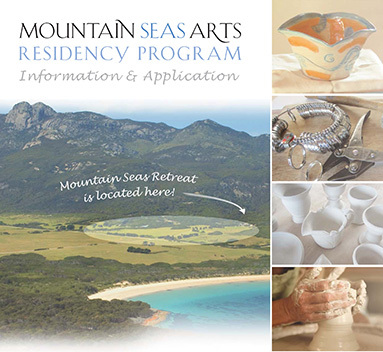 Mountain Seas Arts expanded its arts involvement beginning in 2014, offering an Artist in Residence Program, now available from April to December, 2016. The Residency allows artists to spend up to four weeks in nature's raw beauty, expressing through their chosen artistic medium. The Program is open to all types of artists including, but not limited to, painters, ceramicists, sculptors, writers, musicians, digital and mixed media artists. A residency allows the artist to experience the character of a place in great depth, inspiring a diverse range of rich and vibrant artistic interpretation. 'Information & Application PDF download available on this page. 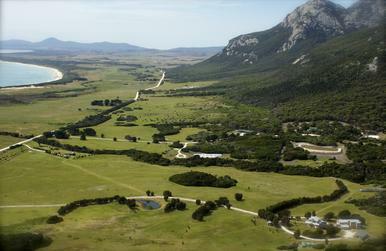 Our aim is to create an exciting Arts and wilderness initiative on Flinders Island by working in conjunction with established Arts bodies; offering opportunities for practicing national and international artists, while providing an artistic connection through workshop to the wider community. 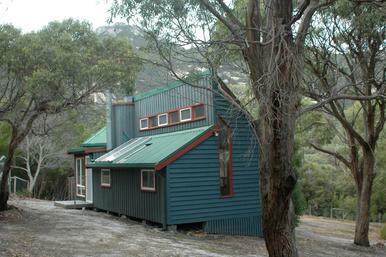 The Studio: a self-contained cottage used for guests and facilitators. It is a 10 minute walk from the main retreat centre. The Art Centre: can host workshops in various mediums, and accommodate up to 20 people in different work areas. 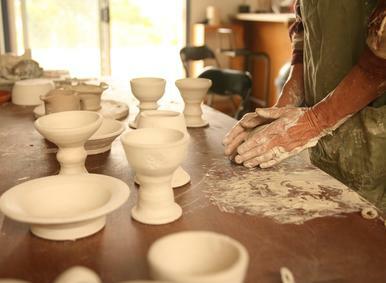 The Art Centre is equipped with two ceramic wheels, raku, electric and wood-fire kilns, hand-building tables, as well as space for acrylic painting, watercolors and other visual mediums. (Specific supplies are subject to negotiation as needed.) The views are magnificent, and there is a place to work outside as well. The Art Centre is ideal for visual mediums (photography, watercolor, acrylic, oils, pastels, drawing), ceramics, sculpture and collage work.The Art Centre is ideal for visual mediums (photography, watercolor, acrylic, oils, pastels, drawing), ceramics, sculpture and collage work. The Yurt: an open room with kitchen and ensuite, which can host up to 25 people comfortably for presentations, films or visual projections. Music, writing and photography workshops are ideal here. It is fantastic for yoga and has basic exercise equipment. It is one of the spaces available for Artists in Residence. We can host your group and provide meals, or make arrangements for you to use our kitchen. Details are arranged with each group. On occasion, we feature special dinners with guest chefs. These events are listed under 'Retreats/Events'. Mountain Seas sources as much local produce as possible. Mountain Seas is contiguous to 40,000 acres of national park. We have private trails accessing tall trees, fresh water streams, waterfalls and sculptural granite boulders. The walk to the highest peak of Strzelecki Mountain begins one km from the property. The beaches, two kilometers from Mountain Seas, are among the best in the world. 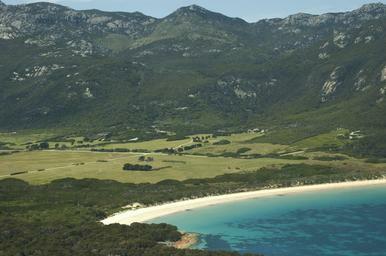 The white sandy beaches of Fotheringate and Trousers Point are featured in magazines such as Australian Geographic. You can visit the Mountain Seas property as a guest at the Mountain Seas Retreat or you can book into a self-contained unit called The Studio. All the various rooms are listed with photographs under "Accommodation" in the menu bar. 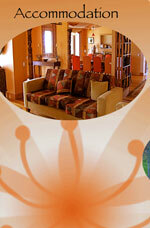 There are a variety of art and health retreats available. If you wish to come visit, you are welcome to stay at our eco-resort on site. A self-contained cottage is available as well by contacting Lila. Live links for both exist in the last paragraph of the Home page. One of our main cottage industries for the Mountain Seas valley will be an eco-tourism resort, with more extensive accommodations which will be built into the Strata Title units, and provide for larger groups. Those who live here, and who have a deeper connection with the powers of this place, can welcome those who visit, and help them touch something deep in Nature and in their own beings. We have the cleanest air and water on the planet (as measured by the meteorological station nearby - the world's baseline). We are certified organic (NASAA 7088). We have energy installations on the property - paramagnetic towers and other energy devices to work with the powerful energy currents and lines of healing that move through here. We have a year-round supply of water coming from Fotheringate Creek. We have excellent growing soils. We provide an important portion of the Island’s needs for vegetables (and some fruits), and have much room to expand. We have a Vegetable Processing Room approved by the Health Department...a cottage industry-use is possible here! Our growing spaces are fenced against the wildlife so prominent here. Our solar systems can be seen as a kind of garden too, harvesting the sun’s light to help power our systems here. We feel that an experience of Nature - its beauty, power, intricacy - can be integrated by expression through art. The arts for which we have chosen to provide materials are clay-work, drawing, and painting. Other arts are practiced here - especially photography and sculptural constructions. An Artist-in-Residence program ensures that a steady stream of very interesting people is staying here and sharing their insights. Applications now available. City living, including suburban living, is so busy with cars and shops that it veils the fact that we depend on the powers and generosity of Nature to support us. We experience the mountain that embraces this valley to be a living intelligence from which we can learn. 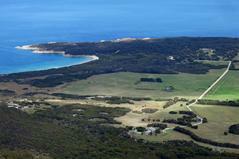 Many places on Flinders Island offer additional possibilities for deepening in relation to the foundations of the earth. Our valley is very special in that regard. The Enchanted Way Walk provides an excellent introduction, from which we can range further in our explorations. We have 40000 acres of National Park on three sides, as well as the great expanse of ocean - Mountain and Seas. To connect the wild powers of Nature with one’s own inner wilderness, one can live in a place such as this or one can visit regularly for a few weeks. The third option - never knowing this beauty and power - is not recommended for one’s personal life or for the future of humanity. We are meant to balance our time in houses and before a computer screen - with quiet listening to the vaster phenomena and cycles of life energy working through the land and through the cosmos. “Sacred” means something that is not about career or FaceBook, but something that involves the deepest meaning one encounters in one’s soul. Everyone can feel how some parts of life require nurturing, yet defy explanation. The production of art in response to personal experience of Nature can be seen as sacred time. The regular seasonal festivals give an opportunity for sacred time at a community level (residents and reaching out beyond to neighbours). Working with an internationally-renowned energy designer, we have installed dozens of small and large devices to manage the very strong energy working through this place. The designer said that he has not seen healing streams this powerful in any other place in Australia.